God was with us…. 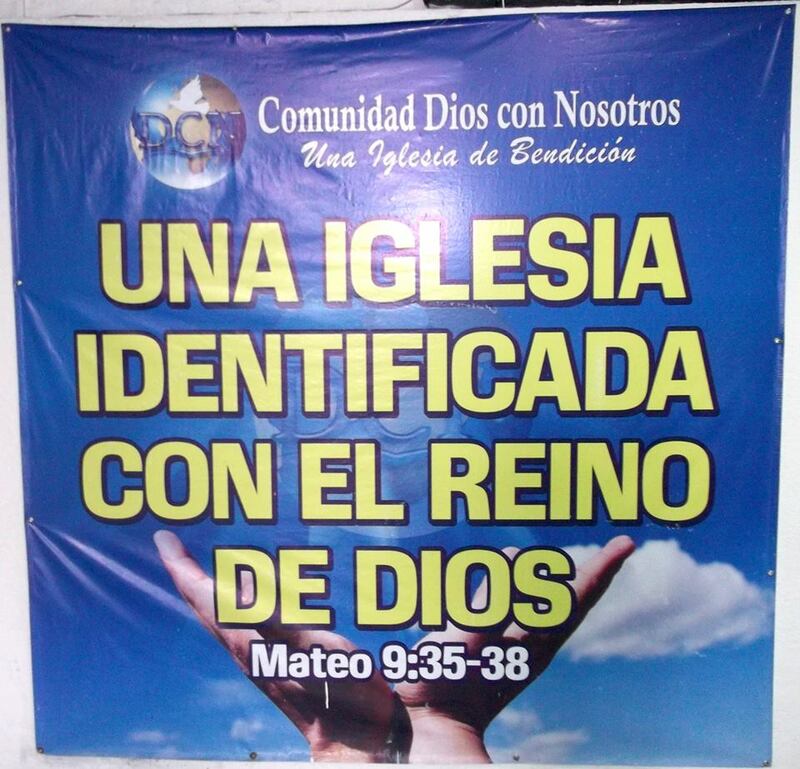 Dios estaba con nosotros … at Dios con Nosotros….. 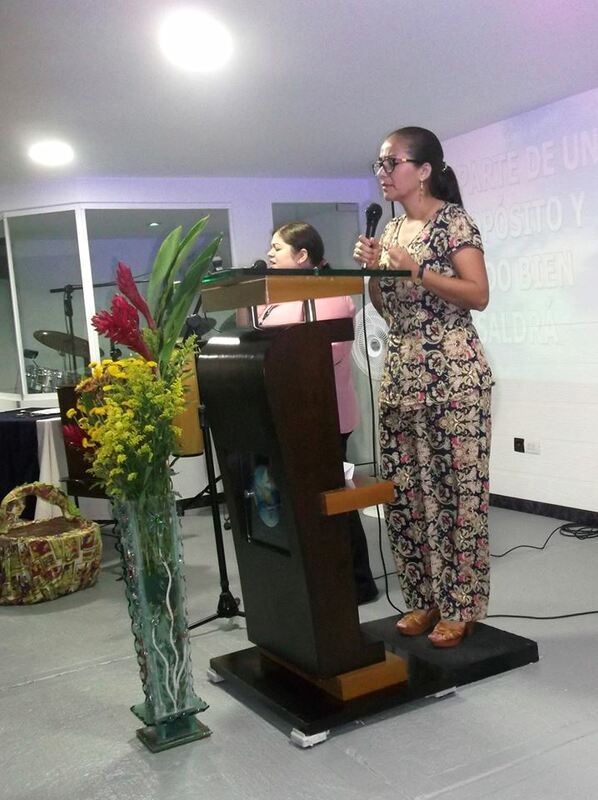 The worship was wonderful, led by Rafael’s wife, Normelly Cárdenas: there’s something really beautiful about worship in Spanish, it’s a beautiful language, I guess being a romantic latin language help, and, as always at Dios Con Nosotros, it set the tone for the whole meeting. 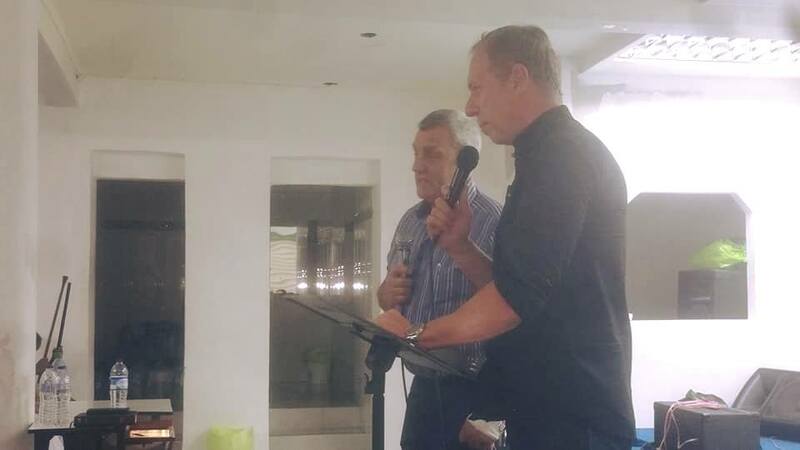 Johnny said the other evening that he had no idea what he was going to say when I got the team to introduce themselves and share what God was teaching them/they had experienced: he was brilliant. Today, he was even better, sharing very well, powerfully, effectively, and concisely…. 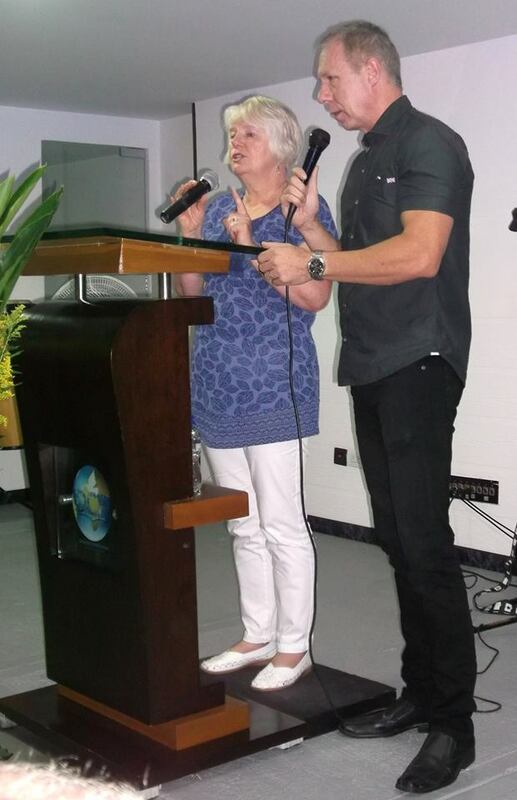 as did Cathy, and Dennis – they’re doing a couple of major seminars this week, as well as a lengthy trip to help at a drug rehabilitation centre, where my great friend, Francisco Riaños, works. Francisco and his lovely wife, Ninny, pastor a church in the north of the city, too, where we’ll be speaking this coming Saturday and next Tuesday. The seminars will be based on SOZO, the wonderful ‘hearing from God’ ministry that has come from Bethel Church, Redding, California. Thanney is a really good preacher, and he shared some great things this morning, which made it very easy for me to ‘wrap up’ everything the others had shared – and then there was a deluge of people wanting prayer for healing and ministry of all sorts. Cathy had her first-ever ‘bullet wound’ person to pray for, a former young policeman, who was greatly blessed and set free from trauma, too. Every one of us had people healed, I had long-time wonderful friend Hein Hoere translating – and praying for people – with me – I think it’d be fair to say that everyone was healed, or well in the process by the time they’d been prayed for. It’s an amazing blessing to pray for the sick: but it’s also incredibly exhausting. Johnny hasn’t done it before – or done it much – and after a couple or so people was shattered – with lots more to follow! One of my greatest joys is to give people the opportunity to see God move supernaturally in someone else’s life in healing, knowing full well that, in the environment of faith in this city, under the open heaven here, that WILL be the story…. Johnny was knackered – as we all were – after 2 solid hours of praying for the sick. Hein and I had one lady – Amanda – with chronic pain from head to feet, especially her knees (what do you expect??!! ), and she went away completely pain-free. A young lady, Jennifer I think, had feared she had cancer – a former nurse, with a large lump in her breast. It turned out that it wasn’t cancer after a hospital ultrasound, but that both breasts were filled with cysts, which medically nothing could be done for. She was in a lot of pain, and still a fair amount of fear: both went, the pain and the fear. Again, I could list healing after healing from the meeting: some big, some not so big but no less significant for the people concerned. 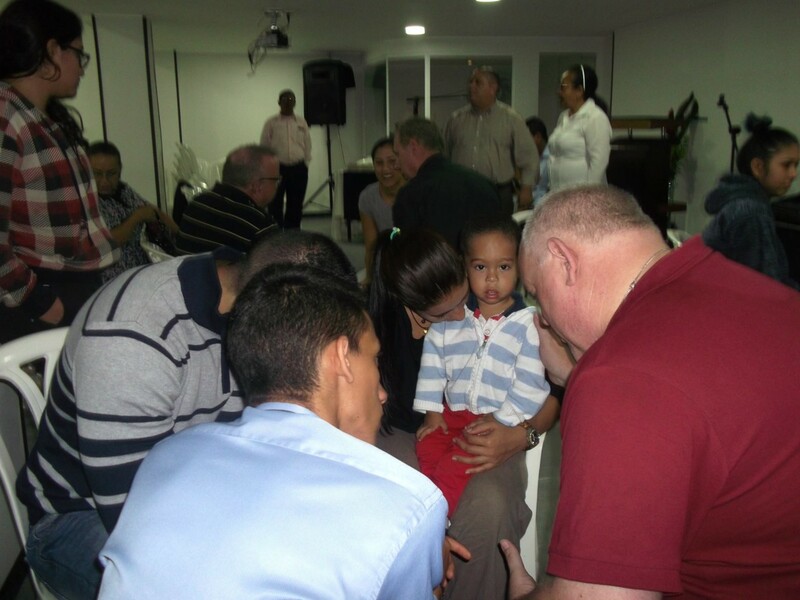 Two hours, and five or more praying non-stop is a large number of people, and for me, it was the ‘icing on the cake’ to be able to pray with Rafael and his family right at the end. Pastor William Castaño and his family, wife Leidy, and son Christian, are at this church, and William is such an amazing Bible teacher and theologian, I feel a bit of a fraud, have to fight some insecurity when he’s in the congregation, but I’m grateful that a) God always seems to turn up in power, and b) I keep getting invited back there!! Lovely day yesterday, beginning with Thanney’s now ‘famous’ ‘almost an Ulster Fry’ breakfast for Wilmar, Marlene, and Sarah: next week it’ll also be Sofia, their eldest daughter, back for the weekend between YWAM outreaches, and hopefully Hein and Teija Hoere, too. It’s a real feast! Tomorrow is a national holiday here, but Thanney and Johnny won’t be taking the holiday (! ), and, as these jolly old knees have been causing me a lot of pain, I’m scheduled in for big cortisone needles to be stuck in each one – what a joyful thought! It’s a real weird, strange, and painful experience: I’d value your prayers – that’ll be 3 pm UK time…. 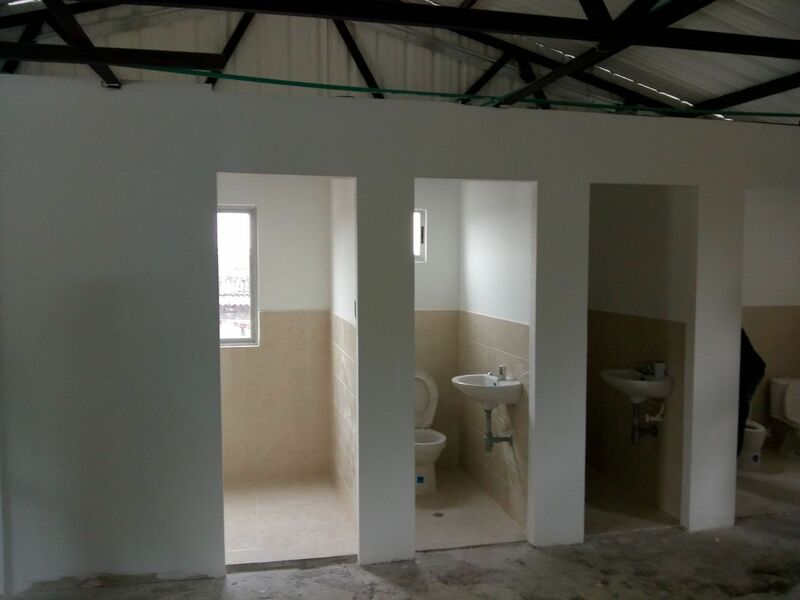 Thank you for your prayers: please keep praying for the finances if you would: the building is SO nearly finished, it’d be tragic if it can’t be completed for the sake of less than 10% of it’s total cost…. For reasons we don’t know, last night’s meeting had to be cancelled as Wilmar couldn’t get hold of the Pastor who’d invited us: it was to have been the first time at his church, so that was sad not to have that opportunity. Lots of other invitations/bookings have come in since we got here, and we’re almost at ‘capacity’ now on the schedule – though with a team of 5 we can split up if needs be. Dennis, Cathy, and I have had some lovely opportunities to be with people to encourage them, pray for them – in their shops, in taxis, you name it…. 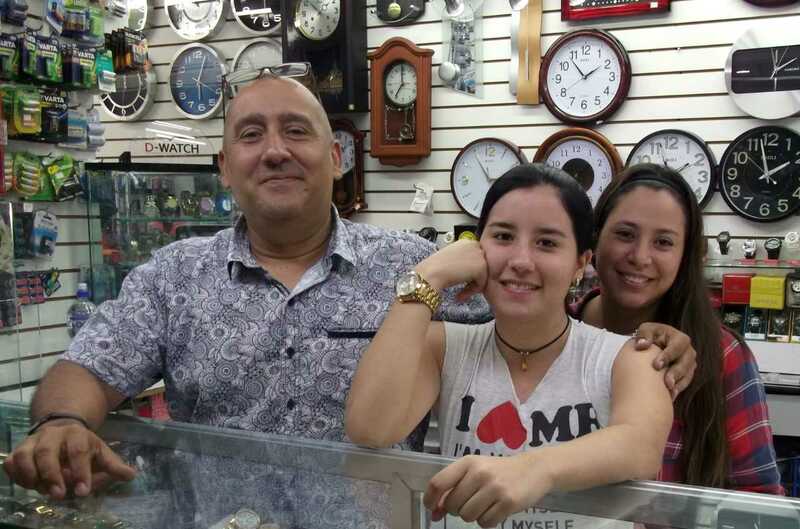 my great friend Fernando, who owns a terrific watch shop, and all being well, he’s coming to church tomorrow morning, maybe – hopefully – with his daughters and son. Great church in the morning, expecting great things! Fernando ‘Mr Watch’ and his daughters…. Run with the horses in Cali! Yesterday (Thursday) was a fantastic day for Thanney and Johnny at the construction site for the kid’s foundation – they got so much done that they’ve gone from being behind schedule to ahead of schedule – so there’s a miracle! Truly, that IS a miracle…. doors are now mostly done for the kid’s toilets, they’ll be finished today: the suspended ceiling is being delivered (please pray with us for the money for it – it’s one of the things I’ve had a real blockage in being able to raise – the ‘£4-5000’ I’ve often mentioned that seems impossible – that money also includes the floor tiles, staircase, air conditioning). God willing – and providing! – the air con goes in next week, and – God providing – the hand-over and inauguration of the new building will take place on 12 November, the day before we return to the UK. I’m thrilled for that fact – at one time it looked as though it wouldn’t happen while Thanney was here, and I’ve prayed that it WILL as he’s certainly ‘run with the horses’ over the three visits to Cali this year in the astonishing amount of work that he’s done – and this trip, of course, with a still ‘broken’ left hand. Johnny has been incredible, too, the amount of work he’s got through – with a chronic back (prolapsed disc) and trapped sciatic nerve… we’ve prayed for them – pray for each other – and these are answers to prayer. The swelling in Thanney’s hand has gone down considerably since arriving – and that despite him having to use it. In cleaning up the building, Johnny has carried so much stuff down four flights of stairs, and been involved in the building jobs that have happened this far…. and his back is less painful than it was in coming here. 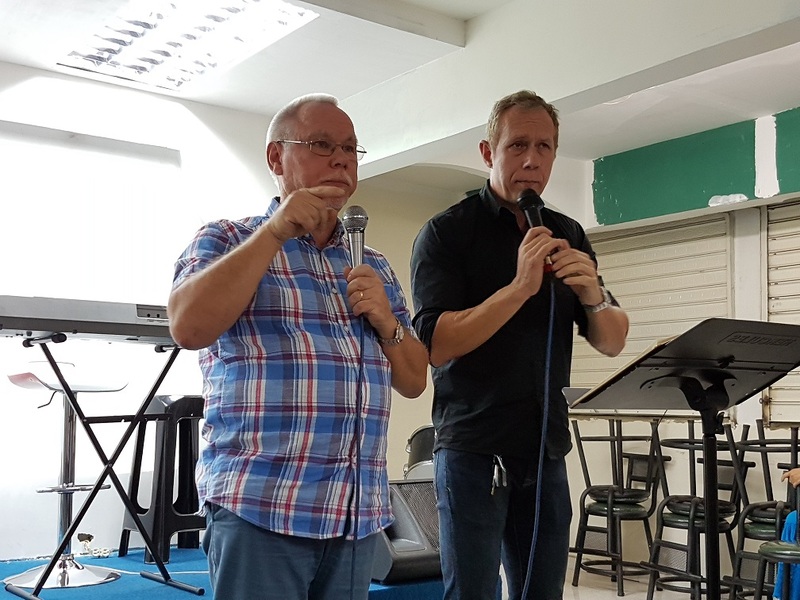 Always, when I arrive here, my amazing friend Wilmar has organised a good number of churches for the teams to be involved with, along with dear friend Pastor William Castaño – always a few gaps in the programme, which take no time at all in filling up! I’m thrilled because Dennis and Cathy, here for 2 of the 3 weeks, have a full schedule pretty much from here on in, including Cathy doing (so far) 2 SOZO seminars in different churches, which has thrilled her to bits. I’m sure there might be more next week, too. Other churches have jumped on board, too, and we’re probably almost at capacity now! 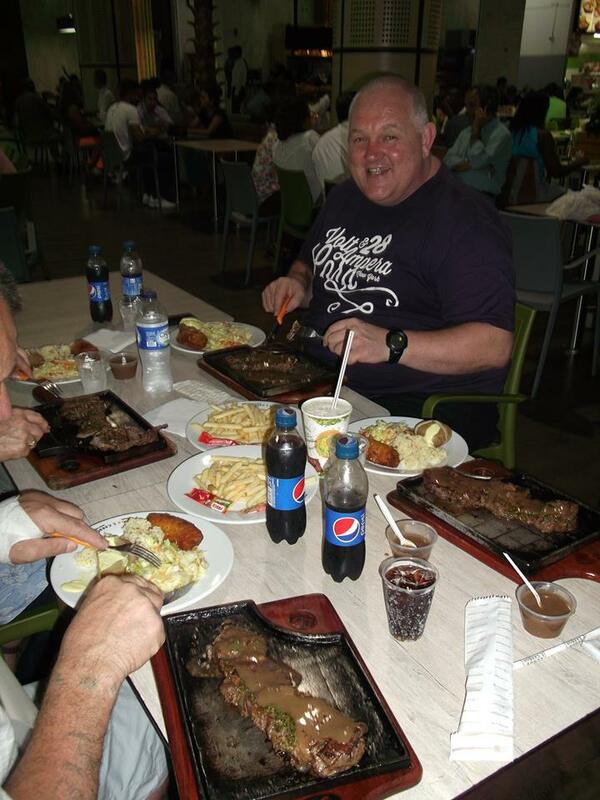 Dennis, who’ll be with Cathy during the SOZO seminars, and at a drug rehab next week…. Cathy, getting ready to ‘SOZO’ some churches in the next 10 days…! God’s presence – always to me, and invariably to the teams that come here – is so tangible here, and moving in the gifts of the Holy Spirit, whether in churches, hospitals, or shopping centres, is so easy… We’re looking forward to church tonight – seeing God move big-time in the church ‘Bajo la Union del E.S’ – which I reckon must translate as something like ‘Under the unity of the Holy Spirit’, but I’m open to correction….! 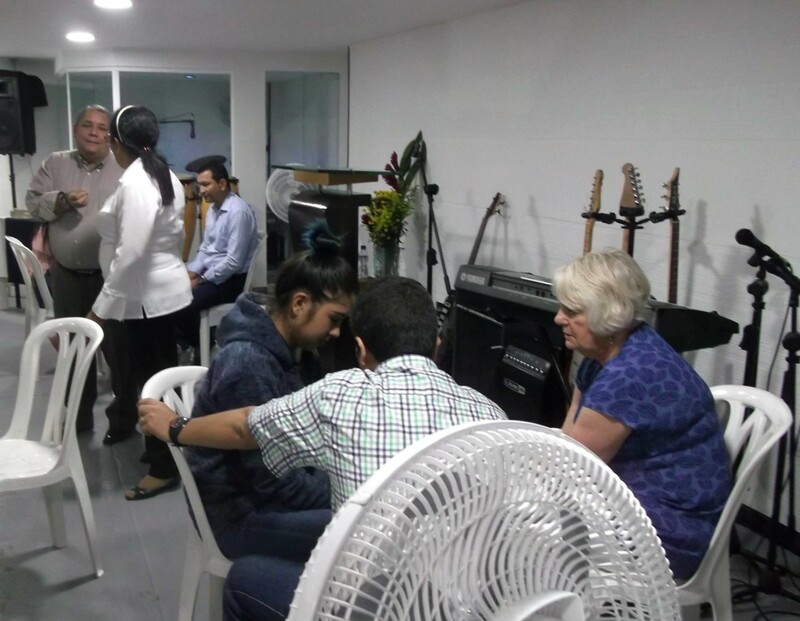 A busy weekend ahead, with one of the highlights tomorrow – the wonderful Christian Drug Rehab Centre, ‘Reconocer’, led by my wonderful friend Enrique Leal. 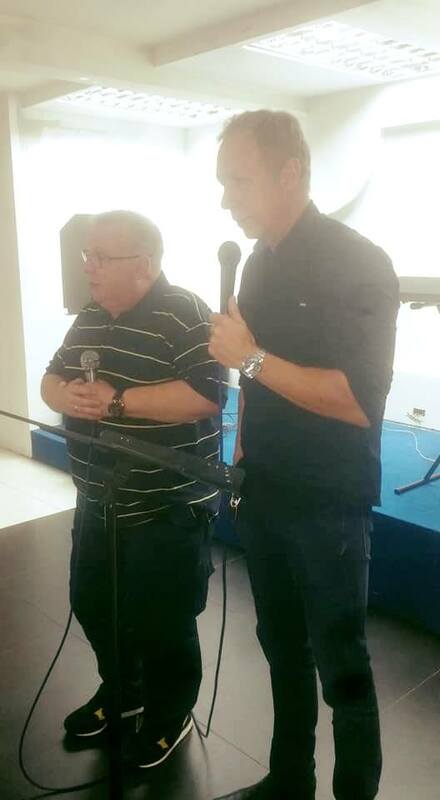 Sunday in a fantastic church – Dios con Nosotros (God with Us) – always healings and miracles there, and Rafael, the Pastor, is another wonderful friend. I’m so grateful, too, for my lovely friend Hein Hoere, who is the translator in these pictures… Hein is a great preacher, apostolic, prophetic, with a healing ministry too, and yet he’s ‘happily humble’ to translate for people like me, when he could do a far better job than I do if he did it himself… there are some lovely translators in the city, and I’m so grateful to God for them. Bless you, Hein!!! He was the first ever translator for me in Cali in 1996, so our friendship goes back a long way! So, we’re all beginning to run with the horses (Jeremiah 12:5) – I’m praying that I can genuinely run with the horses on these knees before I leave here!! Thank you for your prayers, your interest in the trip, your love, care, and support. If you feel able to help with the shortfall in finance, please email me (paul@paulbennison.com), or 9private) message me on Facebook (I’m Paul Bennison on Facebook, unsurprisingly! ), or – if you have my phone number in your phone and use WhatsApp, that’s just as good! A lovely start to this long-awaited trip – great team, bonded really well together: Dennis & Cathy Acott from Maidstone, Johnny Mawhinney and Thanney Pyper from Bangor, Northern Ireland, and me – from Bangor via a circuitous route! 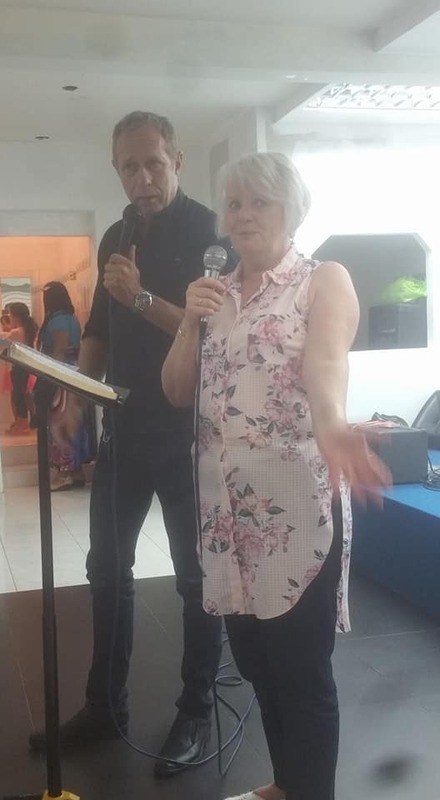 The journey was, of course, long (just a bit short of 24 hours: the flight was ok, but the trip started well having a lovely time praying for my dear friend Margi Bland, in the Flying Chariot restaurant in Heathrow Terminal 2 – start as you mean to go on! We were grateful for that opportunity, and for the food there, as the food on the flight, to be complimentary to it, was dire! We went, with miracles having happened for Thanney – his broken hand being SO much better, and so opposite to what the doctors had predicted – pins to hold the bones together and new plaster cast – all he has is a small velcroed plastic guard for it! : Johnny, for whom God answered prayer with provision for the trip: and me – even up to the Sunday, and into this week, these old knees being so bad I couldn’t really walk, but I’m here, and walking (even if with some difficulty, and slowing the other guys down! ), and Dennis, who doesn’t handle heat too well, doing very well in this climate…. Oh yes, and a new miracle for me – I slept the whole journey from London to Bogota, and even on the 40 minute flight from Bogota to Cali. I NEVER normally sleep on planes…. At the El Abrigo Foundation, Thanney and Johnny have done a big ‘clear-up’ job, assessed what was done in Thanney’s absence since July, assessed what is needed to get the place ready for it’s ‘inauguration’ on November 12, the day before we fly home. They’ve already worked hard, carrying tons of ‘waste’ steel, plasterboard, etc., down 4 flights of badly designed stairs, which took them hours… We are still praying for the Lord to provide around £4000 to get the place complete for November 12 – a relatively small amount out of the overall cost of £55,000, but it’s seeming difficult to shift that shortfall…. I’ve taken Dennis and Cathy around the city a bit to acclimatise them to the culture, as well as the climate…. and in doing that we’ve prayed for people in shops, in a ‘downtown’ shopping centre, which once upon a time I was ‘banned’ from going to by the people I stayed with in the early days here 20+years ago, as it was too dangerous…. I have many friends there now who run or own tiendas (small stall-like shops): a lovely time today with my long-time friend Fernando in his watch shop (I love watches, but have really grown to love Fernando, and his daughters, who help him run his shop. He’s coming to church on Sunday morning, a lovely church – Dios con Nosotros (God with Us), and I think the family will come too. This ‘dangerous’ place had us all sitting behind the counters (I’m always invited in, but normally it’s only me!) – and served with coffee, water, a lot of lovely personal friendship hospitality, and Fernando wanted to bless us with the gift of a watch each… of course, we declined… not!! Cathy, who has a wonderful ministry of putting people in touch with God (Sozo), in inner healing too, as well as physical healing prayed with a young girl who was obviously in pain, physically and emotionally (Los Lagos is VERY poor as well as dangerous), and she was beautifully blessed by God through Cathy talking to her, praying for her, and hugging her… a hug can bring more healing sometimes than hundreds of words…. Johnny, who suffers from a prolapsed disc in his spine, and severe back pain/sciatic nerve pain, and I prayed with a lovely lady – Amanda – 76 years old, who ‘acquired’ chronic back pain when she was 16. Ok, so it was Johnny’s first ever meeting here, but I said to him this one’s yours, mate(! ), and Johnny prayed: I asked Amanda how her back felt. ‘The pain feels like a little ant moving in my back’ (after 60 years of chronic pain! ): prayed for her for a few minutes more, and the ‘ant’ was deceased…. 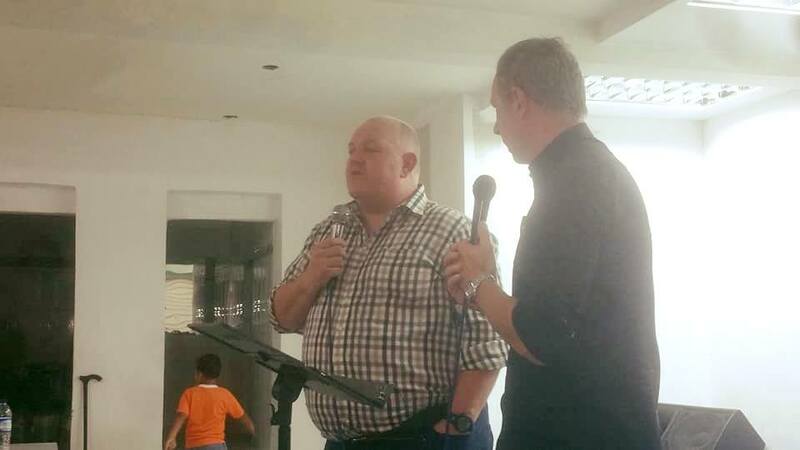 Others were healed, and blessed: a lovely man, David, with a number of really nasty physical problems, was visibly getting freed from them as he had the ‘heavies’ – Thanney, Johnny, and me – pray for him. Cathy’s been asked to talk about Sozo, and do some of the ministry associated with it, in one church already, and there’ll be more, I’m sure. People outside of meetings are lining up to be prayed for, and what might look a relatively ‘relaxed’ programme on the day we arrive rapidly morphs into a packed programme – as packed as the traffic will allow us to get to people! Cathy’s thoroughly enjoying (NOT!!) the traffic…!! Other people want us for other meetings… it’s a wonderful privilege to be given the opportunity to speak in so many places, so many churches, pray for some many people…. A terrific time tonight praying for Wilson and Luz Eneth, as tomorrow they take a team right down near the Ecuador border, of 32 people, with trucks laden with food, clothes, toys, and so much more: I can’t remember the name of the city, but it’s poverty-stricken, still with much guerilla activity, a lot of murders – a really dangerous and needy place, with only one church…. Please pray for that trip: a long drive first, then 22 hours on a boat – exhausting, and certainly worse than London to Cali by Avianca Airlines! Well, it’s 0145 a.m, I think I need sleep now! Dennis spoke powerfully tonight ….. Someone else who spoke a bit tonight…. 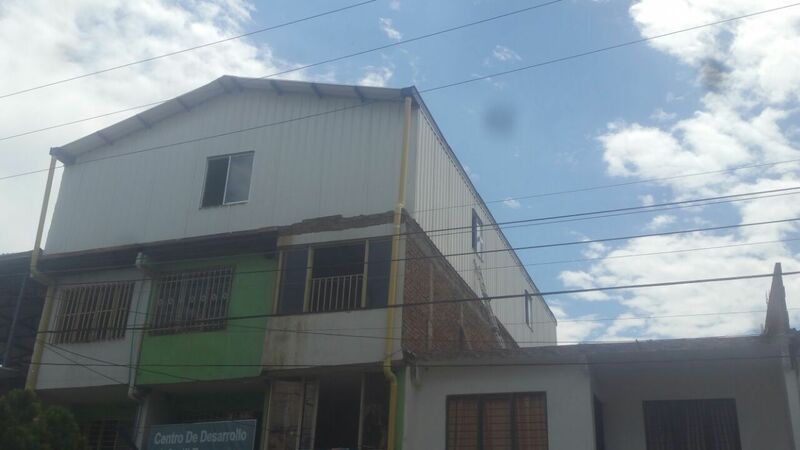 Many of you know that, in a week’s time, a team of 5, becoming 6 later in the trip, heads out to Cali, Colombia, for the third time this year, to finish the construction of the wonderful house that will radically benefit a poor community in the poorest part of Cali…. it’ll be a refuge for deprived kids, and a brand new church in an unchurched area. We’re all going at our own expense (with airfare, accommodation, food, expenses – around £2500+ each). 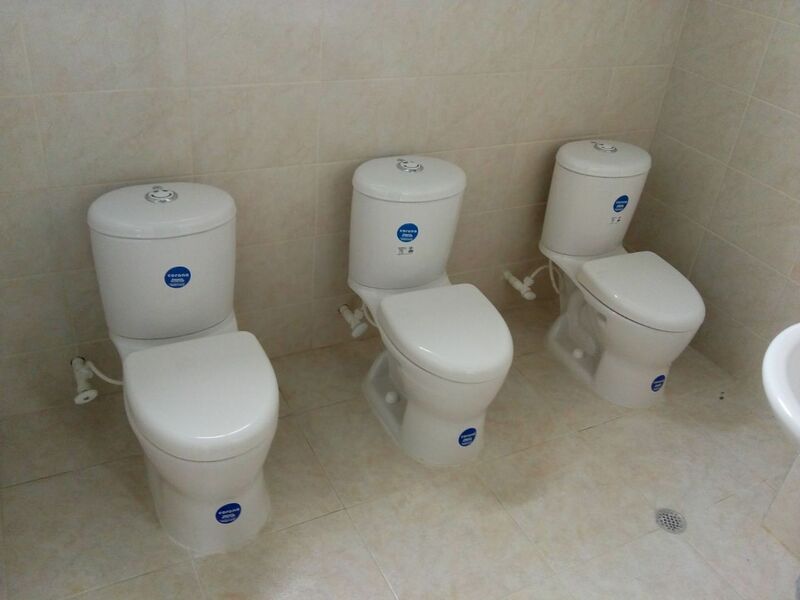 We’ve needed £4-5000 for some weeks to complete the house. At the moment, we’re going anyway, but we DON’T have the money to finish the house….so many people know about the house, many think it’s amazing…yet we’ve had ‘promises’ from people to say they want to give – and then haven’t (why do people DO that? It’s better to say nothing at all when the intention ISN’T there to give) – and probably, over the three trips, we’ve had gifts from (maybe) 3 churches, small churches where the only contact has been with me preaching there once, and Thanney Pyper talking about the project…. If ONLY there were more churches like Sycamore Creek Church…God blesses BACK exponentially when we’re generous beyond human limits, not just financially, but spiritually, too…. I made a decsion years ago that, when ordering a ‘take away’ meal to be delivered (which mostly the company charge for) I’d give the delivery person a tip on top of that. Most of them are absolutely stunned, and so, so grateful. You can’t outgive God…. I posted the video (link below) a few days ago, but I don’t think it opened. It’s just 2 minutes long, and shows the house from the ‘nothing’ beginning, to what Thanney has achieved ahead of our going there again next Sunday, for 3 weeks, when the project – God willing – will be completed. It’s well worth watching, an incredible achievement. When you think how many lives this building will impact (it’s going to be used as a church, too, in a totally unchurched area) – the link will ask you to download it (don’t worry, it’s safe!) and so worth 2 minutes of your time…. this has all been achieved in 4-5 working weeks – a humanly impossible miracle – and because of the struggle to raise all that has been needed to build it, we’ve seen God do miracle after miracle by ‘stretching’ money…. 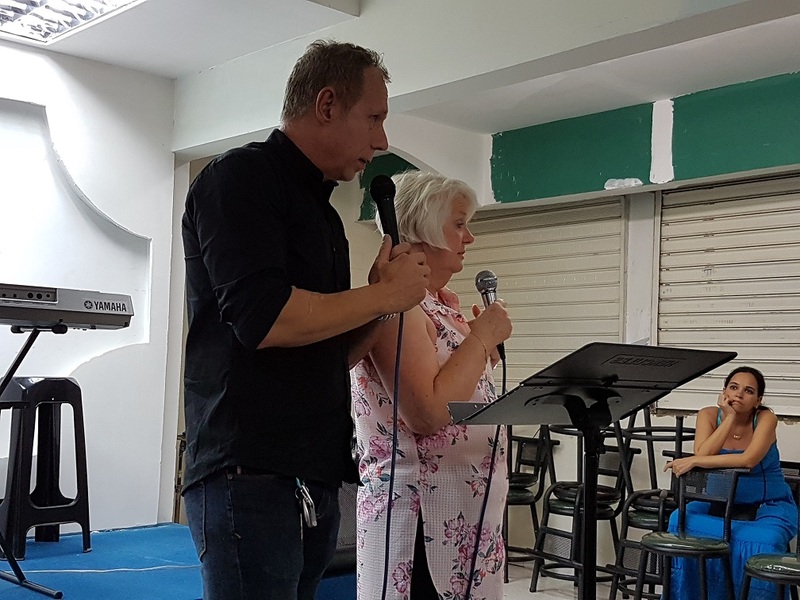 Our friend, Stephen Lennie, has put together a Powerpoint presentation of what God – and Thanney Pyper, and a few local volunteers – have achieved, in very little time, with the refuge house / church for the El Abrigo ministry in Cali, Colombia. You’ll see how much has been done so far: but also see that there is still much to do, which Thanney aims to complete in 3 weeks when we arrive there on 22 October. Breaking his hand today was a shock, and very painful: but I know that Thanney has every intention of somehow finishing the project…. Your help and support, and God’s supernatural provision, have got the building to this stage: somewhere in excess of £40,000. A further £8-10,000 is needed, of which we have received/raised in excess of £4,000. We’re believing for the rest to come in, even more so now that the enemy has tried to take Thanney out of the picture (in all his years of building, nothing like this has EVER happened to Thanney before!). If you can help, please message or email me….we’d be so, so grateful. Urgent prayer for the Cali trip, please! 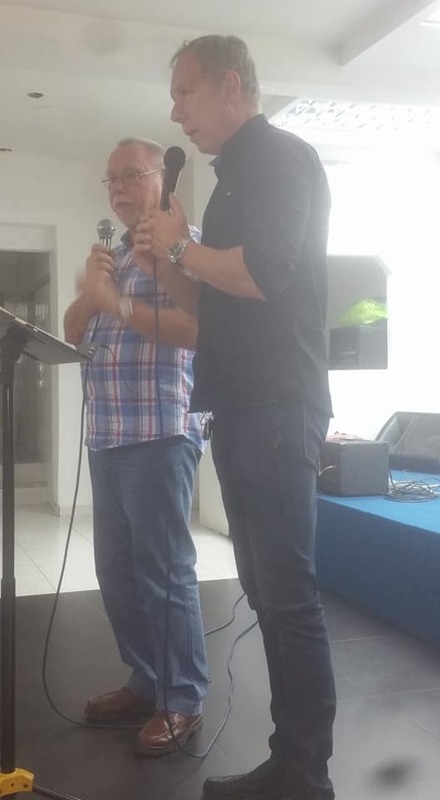 Some urgent prayer, please, for the trip to Cali, Colombia – two weeks time, this morning, we’ll have arrived in Cali: today, at work, Thanney Pyper – who is working his socks off here ahead the trip – broke his left hand in a work accident. His arm is plastered to the elbow, he’s in a lot of pain: we’re getting together tomorrow to pray for miraculous healing, as this trip is the culmination of the building project for the refuge for street kids….. without a miracle Thanney could well be in plaster for the next 8 weeks….and these two weeks are critical for him, too, as he’s self-employed, and without being able to work, he won’t earn a bean…. There have been many attacks on this trip to date, this is doubtless the most significant. We’d REALLY value your prayers. Thank you…..
Just over two weeks to go until my team head out to wonderful Cali, Colombia. 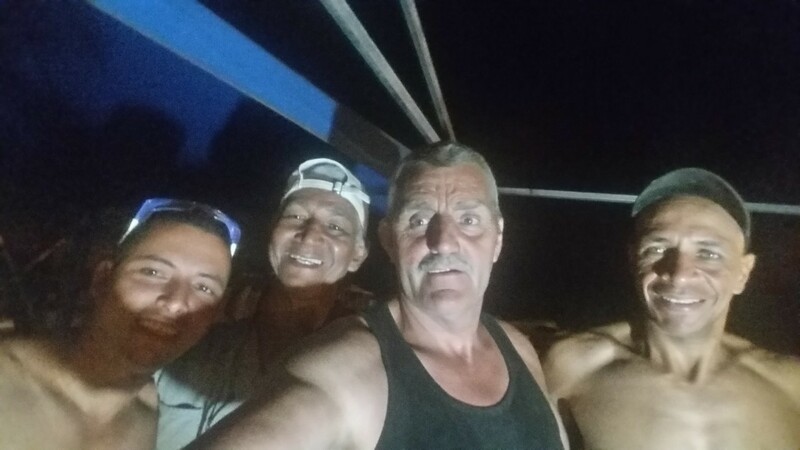 Thanney Pyper is looking forward to finishing the construction of the tremendous kid’s refuge, and handing it over to great friends Hein Hoeré and Teija Tuulikki Hoere, and Wilmar Gomez and Marlene Rojas Gallego, leaders of Mision El Abrigo Internacional…. 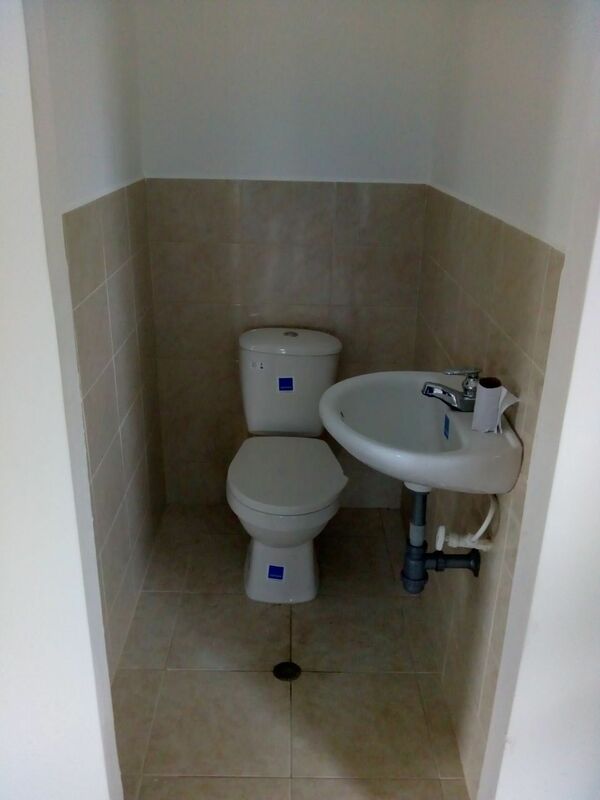 We are amazed at how the Lord has provided since the construction began in March: the building is a true testimony to the building skills of Thanney, as this has all been achieved in around 4 weeks actual building time. Incredible, Thanney, God bless you! We are a somewhat short in the budget for this final phase (not a great deal in the context of the overall cost! ): and I wondered if anyone would be willing/able to sponsor some of the final things that need completing, and some of the items that are needed for the new church that will commence meeting here, we hope, on November 12, when the building is ‘handed over’? Of course, these are just sample amounts for individual sponsorship, we’d be grateful for whatever gift you could give to bring this wonderful project to completion! Private message me and let me know if you can help.